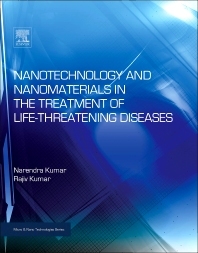 Nanotechnology and Nanomaterials in the Treatment of Life-threatening Diseases takes a scientific approach to nanotechnology and nanomaterials applications in medicine, while also explaining the core biological principles for an audience of biomedical engineers, materials scientists, pharmacologists, and medical diagnostic technicians. The book is structured by major disease groups, offering a practical, application-based focus for scientists, engineers, and clinicians alike. The spectrum of medical applications is explored, from diagnostics and imaging to drug delivery, monitoring, therapies, and disease prevention. It also focuses specifically on the synthesis of nanomaterials and their potential health risks (particularly toxicity). Nanomedicine — the application of nanomaterials and devices for addressing medical problems — has demonstrated great potential for enabling improved diagnosis, treatment, and monitoring of many serious illnesses, including cancer, cardiovascular and neurological disorders, HIV/AIDS, and diabetes, as well as many types of inflammatory and infectious diseases.